(BALLWIN, MO) At the championship games Saturday night for the Arch Rival Roller Girls (ARRG) and GateKeepers Roller Derby (GKRD), trophies were handed out to a pair of squads that were on opposite ends of franchise longevity, one that has been in existence for eight years while the other was launched six months ago. 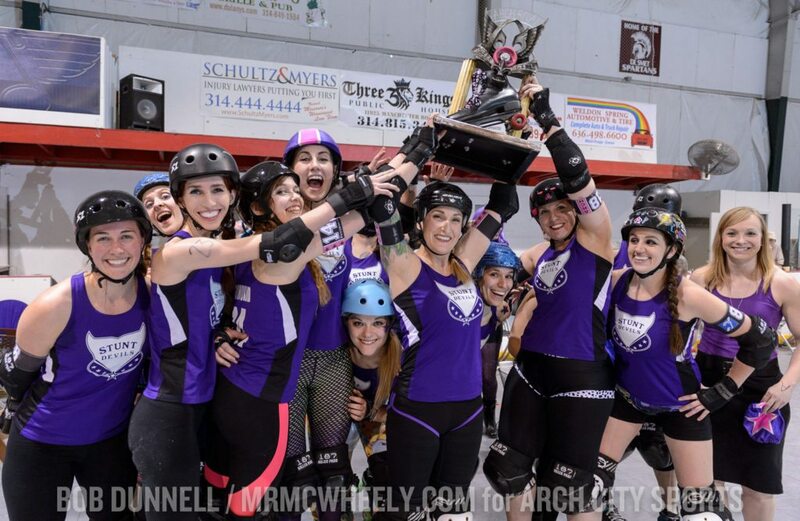 In the women’s main event in front of 650 at Midwest Sport Hockey, the Stunt Devils overpowered the M-80s, 221-150, to claim its second straight ARRG title while in the men’s opener newly-minted Raiders of Forest Park claimed its inaugural GKRD Turf Wars championship with a 158-138 duke over the Central West Friends. The defending champions netted back-to-back leagues titles, and fourth overall, by utilizing a bone-crunching defense early and never trailed in the 2016 women’s finale. Leading 2-1 after the opening rotation, jammer Psychokid d’Freakout collected a ten-point strike that pushed the Stunts’ lead to 11-1 two minutes in. After the M-80s scored three that sliced the lead back to single-digits, Bricktator notched nine for the Stunt Devils with 26:00 left in the period to extend the score to 20-4. The advantage was pushed to 30-5 after CupQuake’s ten spot collected at 22:40 mark. 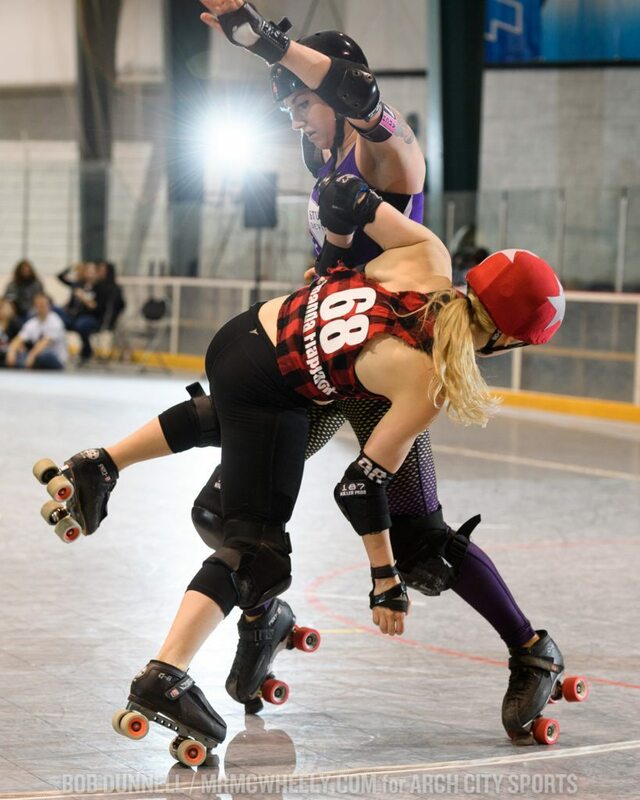 Midway through the period, and trailing 41-9, M-80s jammer D’Manda Flapjack, who had single-handedly scored all the team’s points in the game’s early stages, utilized a 14-5 power jam with 15:05 left that shored the score to 46-23. CupQuake countered the M-80s’ strike by cooking up a baker’s dozen in the ensuing rotation and widened the Stunts’ lead to 59-23 at the 14:40 mark. The differential was pushed to 40 points after Bricktator’s 8-4 jam that made the score 67-27 with 12:40 left in the first period. The margin remained at the same clip in the latter stretches of the frame. With 5:45 left in the period, the Stunts maintained an 86-46 lead. 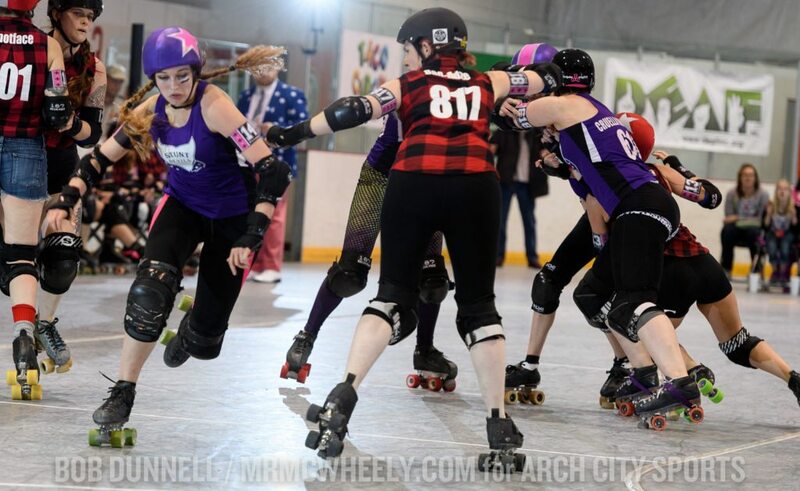 Then the defending champs’ blocking schema, paced by Shear-Ra Powers, Aceta Menacin, Ninja Sass ‘Em, Aggie Wartooth, Soundproof, Cruella Belle-ville, Midnight Smack, Pegasass, Momentum Mori and Stormin’ Norma, went into lock-down mode and propelled the team’s 44-4 late-period run. Highlighted by d’Freakout’s 27-point penultimate jam, the rally helped the Stunts possess an eye-opening 130-50 advantage at intermission. Much to their credit In the second period, the M-80s’ walls set-up by blockers Oak, C’Mon!? !, Lone Pine, Bad Adze, Trigger Happy Jackie, The Ginger Assassin, Let’s Get Beard, Molotov, Warpath O’ Jen, Paul Funyun, Arcane Sugar, Snotface, Bloody Gaga, Jenforcer and Quicksandz significantly reeled in the Stunts’ jammers and surrendered zero multi-pass scoring rotations in the half’s first twelve minutes. Although the M-80s never overwhelmed scoring during this stretch, the ensuing 29-16 run did display signs of upward trajectory as they had narrowed the score to 146-79 with 18:10 left in the game. 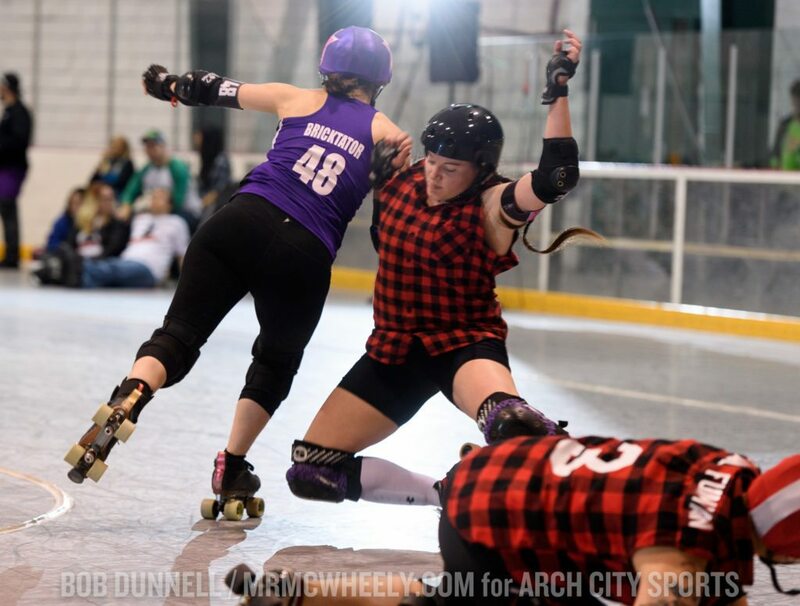 Any late-game heroics by the “lumberjills” were dashed on the next rotation as Bricktator scored an even-strength 29-1 jam that extended the Stunts’ lead to 175-80 with 16:30 left. 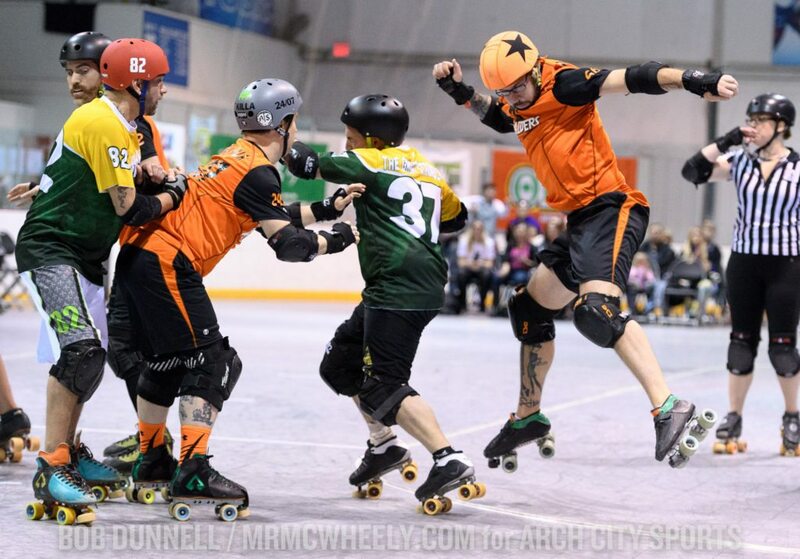 The M-80s played valiantly down the stretch, capitalizing on Flapjack’s pair of 14 point jams as well as a 13-point strike tallied late, to outscore the Stunts in the period overall, but the halftime deficit was way out of reach to make a significant charge. 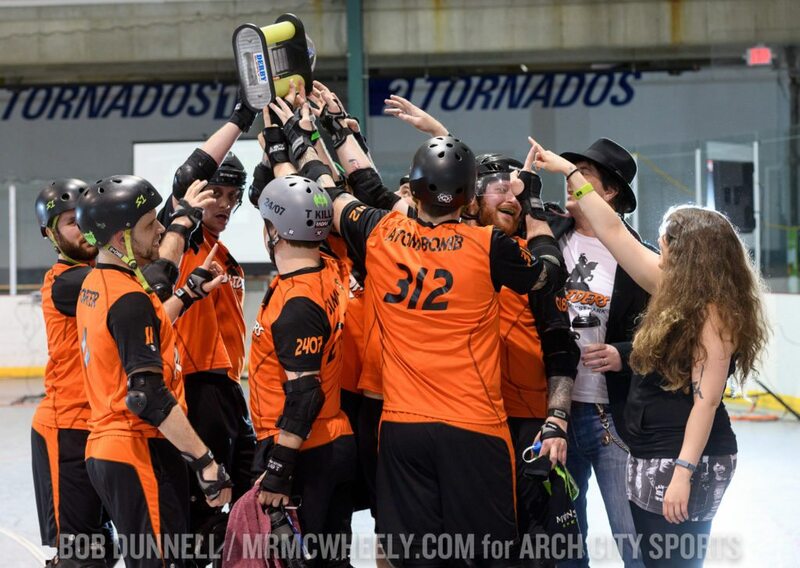 The Stunts cruised to the 221-150 victory to hoist its fourth ARRG trophy. Bricktator finished the evening with 85 points, followed by CupQuake’s 76. Flapjack topped the runner-up M-80s (3-2) with 77 points. STUNT DEVILS (221): Bricktator 85, CupQuake 76, Psychokid d’Freakout 60. M-80s (150): D’Manda Flapjack 77, Let’s Get Beard 43, Molotov12, Paul Funyun 10, Warpath O’ Jen 4, Lone Pine4. 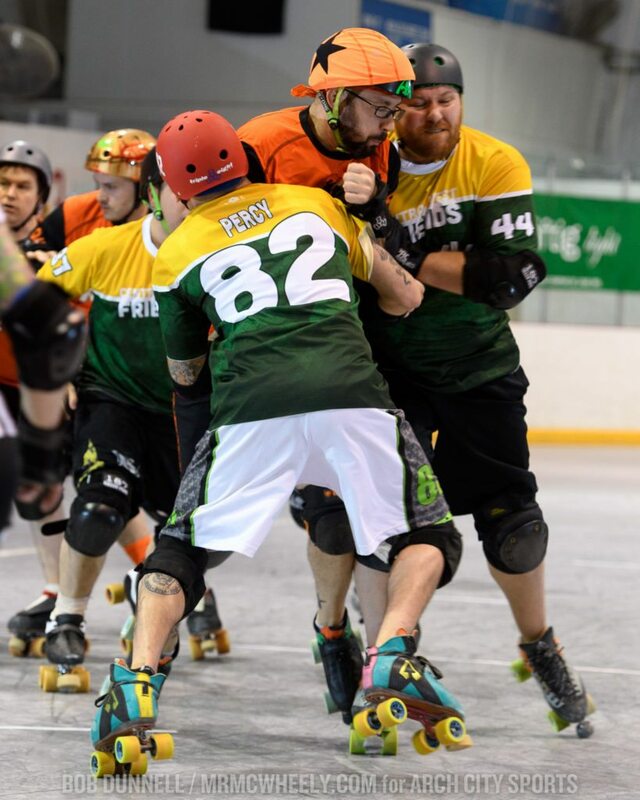 The men’s finale, by contrast, had a two-point differential at halftime, but the Raiders’ 61-9 charge in the second period provided the cushion needed for the first-time franchise to win its fourth straight victory that resulted in the team’s inaugural Turf Wars’ title. Trailing 4-0 after the opening jam, the Raiders collected nine straight and led 9-4 after Porter’s five point strike at the 24:50 mark. The scoreboard flipped back to the Friends’ favor with Bower Ranger’s 19-point power jam that gave CWF a 23-9 advantage with 22:50 left in the period. Forest Park went on an ensuing 50-0 slaying that resulted in a major momentum shift. After 14 uncontested points were scored that tied the game, 23-23 at the 20:20 mark, Raiders’ jammer A. Black scored four that gave his squad a 27-23 edge with 19:15 left in the frame. Then on the next rotation, Mouthful gobbled a 30-point eye-opening jam at the 16:55 mark that extended the lead to 57-23. Black’s pair of points finished the rally and the Raiders possessed a 59-23 advantage. The Friends managed to chip away at the deficit and narrowed the score to 65-45 following Ranger’s 14-point power jam with ten minutes left in the period. Raiders’ multi-specialist Adam Bomb countered with a grand slam with 8:00 left to extend the score to 70-45. CWF then went on its own rally for the remainder of the period and collected 23 points uncontested to eventually shore the score to a pair of points at intermission. 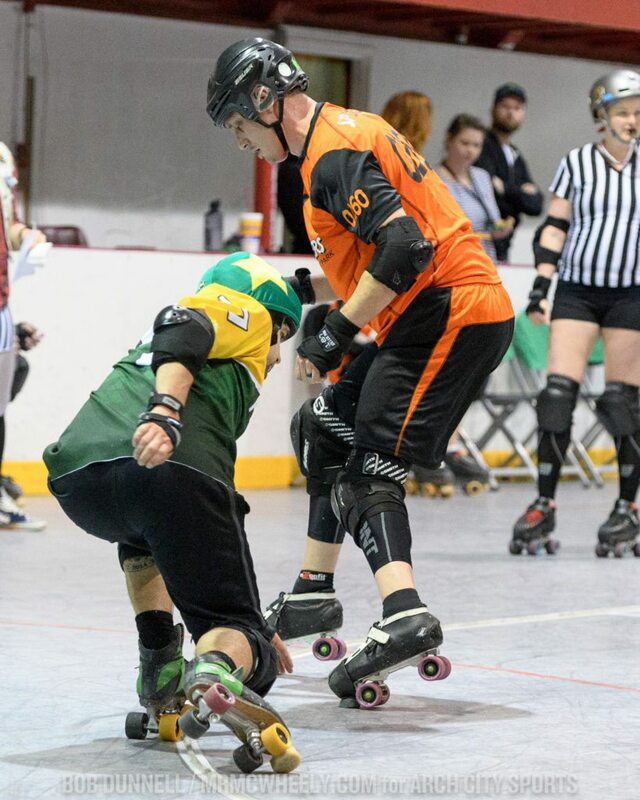 With blocking paced by Perc In Boots, SoGo, Poppa Choppa, Last Rites, Fruit Wall-Up, Monster Jam, The Great Stromboli and Red Rider, the Friends grabbed the half’s final six lead jams, scored numerous four-point passes, and sliced the Raiders’ lead to 70-68 at halftime. The momentum carried over into the first jam of the second period and the Friends notched a 72-70 lead change following Ranger’s four-point strike. The Raiders regained the edge with Mouthful’s four that gave the lead back to Forest Park, 74-72, three minutes in. 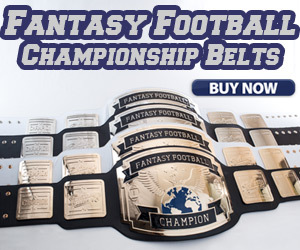 This started a groundswell of Raiders’ points that set the tone for championship victory. With blockers Spin Diesel, Bower, Mueller, Porter, Dr. Dredd, Bomb, Slammin’ T. Killa, Oxford Coma and Arty Panimal leading the charge, Forest Park went on a 57-5 rally over the next fifteen minutes. Highlighted by Mouthful’s 23-point power jam scored with 22:00 left in the period, the Raiders expanded its lead to 131-77 with 12:20 left in the game. The Friends swiped away at the deficit and narrowed the score via a two-jam, 28-6 run accented by Ranger’s 14-point strike with 7:30 left that whittled the Raiders’ lead to 137-105. Black’s 10-5 jam with 6:15 left pushed the Raiders’ edge to 147-110, but the Friends had late-game heroics in its collective mindset. By collecting four consecutive lead jams, resulting in a 24-2 rally in the game’s waning minutes, CWF climbed back and only trailed 149-134 heading into the final jam. 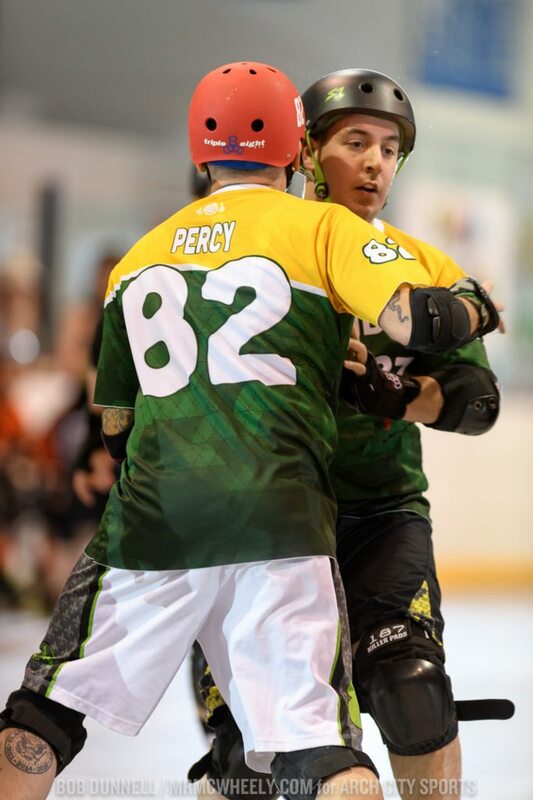 With the Raiders’ Porter and the Friends’ Ranger possessing their respective team’s star on the championship game’s final jam, a 9-4 collection for Forest Park secured victory and trophy acquisition. The Raiders outscored the Friends in the second period, 88-70, to claim their first-ever Turf Wars title with the 158-138 duke. Mouthful finished the game with 89 points. Central West Friends, who finished in the runner-up slot with a 3-2 record, was paced by Ranger’s 80 points. RAIDERS OF FOREST PARK (158): Mouthful 89, Porter 33, A. Black 31, Atom Bomb 5. CENTRAL WEST FRIENDS (138): Bower Ranger 80, Mailbox 53, Monster Jam 5. 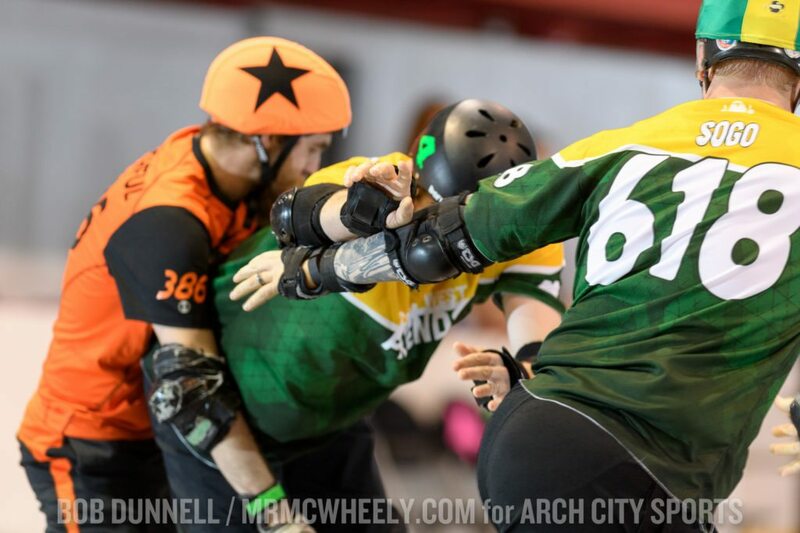 With local campaigns now concluded, both St. Louis-based roller derby leagues now turn their collective attention to their respective travel team schedules. The pair will compete at the “Big O” invitational April 29 – May 1 in Eugene, Oregon. GateKeepers Roller Derby are the defending champions of the Men’s Roller Derby Association (MRDA) while the women’s league, which has officially changed its name to Arch Rival Roller Derby, is currently ranked tenth internationally by the Women’s Flat Track Derby Association (WFTDA). 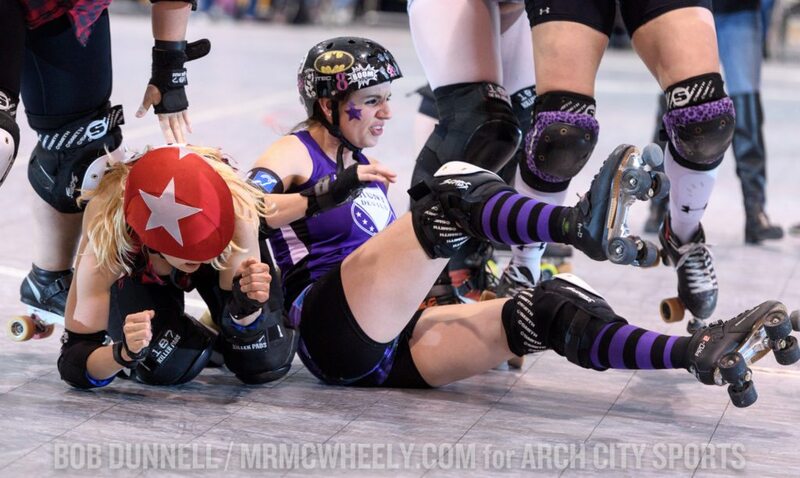 For more information on the Arch Rival Roller Derby, go to THIS LINK. For more information on GateKeepers Roller Derby, go to stlgatekeeprs.com.